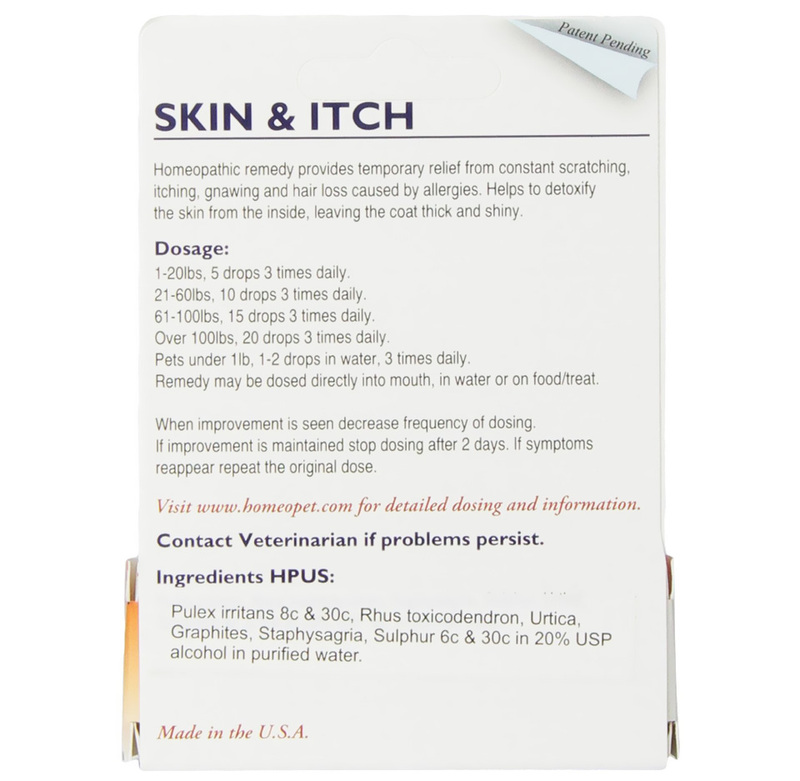 Homeopet Feline Skin & Itch Get your cat a reason to purr with the HomeoPet Feline Skin & Itch Cat Supplement. 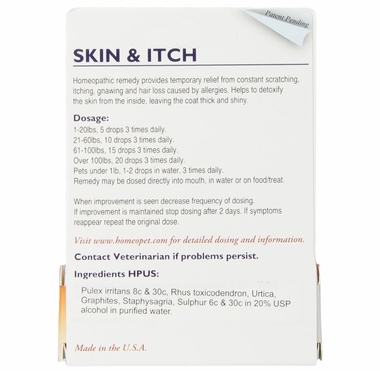 Working to detoxify the skin from the inside out, this homeopathic liquid provides temporary relief to constant itching, scratching, gnawing, and hair loss caused by allergies. Drawing on hundreds of years of natural medicine therapy, the all-natural formula uses only the purest, chemical-free homeopathic ingredients that cause zero known side effects. Easily administer by mouth or food or water—your itchy pet will thank you, and you’ll love his luxurious skin and coat! 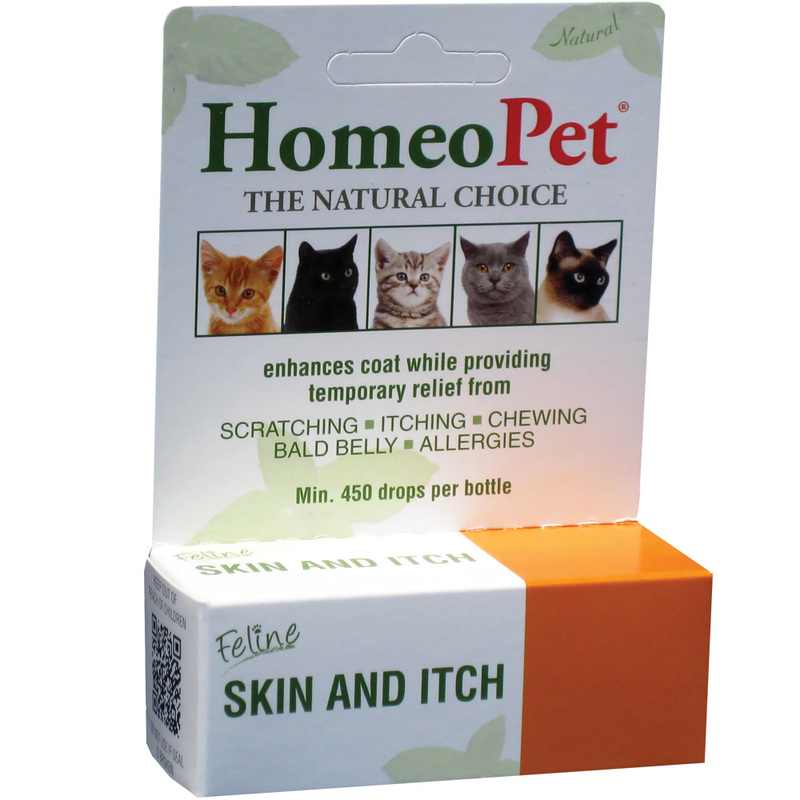 Homeopathic drops promote temporary relief for cats suffering from seasonal allergies and skin allergies. Detoxifies the skin and improves the coat while relieving constant itching, scratching, gnawing, hair loss, and bald belly. Fast-acting liquid drops are made in the USA and registered with the FDA. Optimally, the liquid preparation should be dropped directly on to the mucous membrane of the mouth, including lips, by raising the head until the mouth opens. Where an animal finds this distressful or an owner is unable to comply, the medication can be put in the food, water or milk or added to a sprayer and misted into air or put onto bedding and allowed to evaporate. Where animals are sensitive to the odor of the alcohol preservative, a 10-20 minute period should be allowed for dilution and evaporation before the liquid or food is presented to the patient. Occasionally, animals will shake their heads as a response to the alcohol preservative and cats may salivate excessively, and in these cases presenting it in food, water or milk works. For severe cases oral rehydration fluid can be medicated to the above dilution and given to the patient orally, taking care to avoid aspiration of the fluid into the respiratory tract by the patient. For acute cases it can be repeated as in the previous dosing section. None known, other than reversible effect of over dosage. Over dosage will result in a return of symptoms after the symptoms have initially disappeared. Where a return of symptoms occurs while on the medication, ceasing to use it will alleviate the effect. Patients who are hypersensitive to homeopathic preparations will show response to a single dose, which may not need to be repeated for some time. For this reason therapy should always start with a single dose the previous day and should a major response be seen, therapy should not be recommenced until symptoms relapse, and then only a single dose given for maximum effect. Although no evidence exists to the contrary, care should be taken with its use in pregnant animals as low potency homeopathics are historically not regarded as totally safe in pregnancy, despite their lack of chemicals. Should a suspected adverse reaction be seen or advice needed, please contact HomeoPet, LLC. Contact your veterinarian if problems persist.